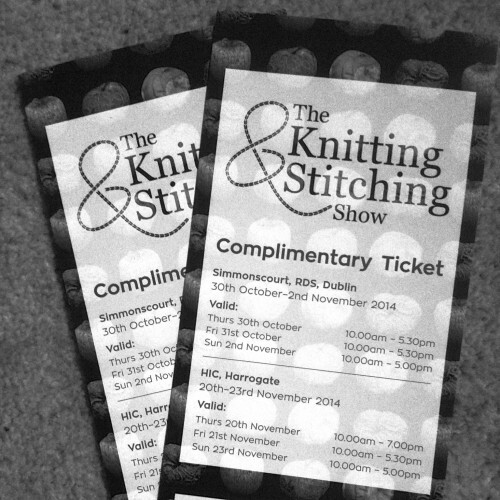 I have 2 tickets for the K&S show, but unfortunately I won’t be able to make it. So YOU can win the tickets! Click here to find out more! British Wool Week has started and living just on the outskirts of London, I am lucky enough to be able to attend some of the events taking place in different locations in the city every day. 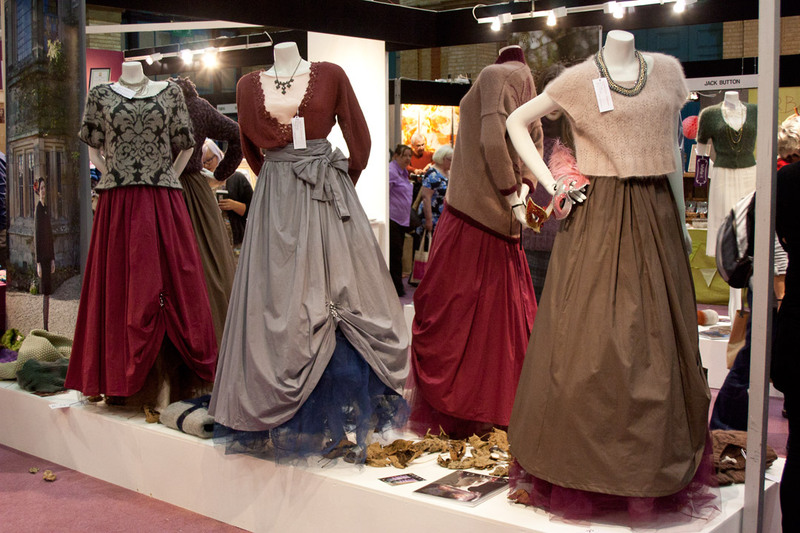 The Knitting and Stitching Show is the biggest show for any yarn and fibre related craft in the UK, attending is mandatory for anybody passionate about crafts. It was only my second time at the show, but I had an absolute blast. I went on saturday, which was probably the busiest day of all. By noon Alexandra Palace was packed with people, and it was so crowded it was actually starting to become difficult to see any of the stalls and talk to people. 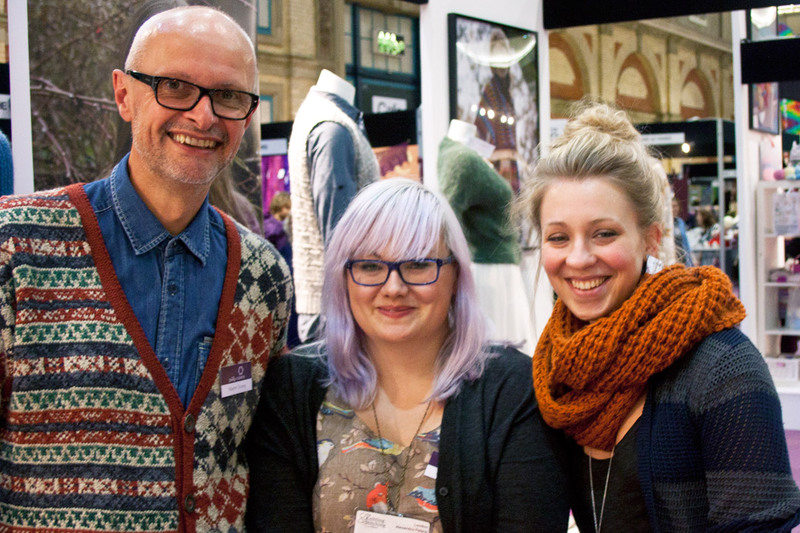 Having been a Rowan Ambassador for several months now, my highlight of the day was meeting some of the Rowan Yarns Staff and being introduced to some of their designers. 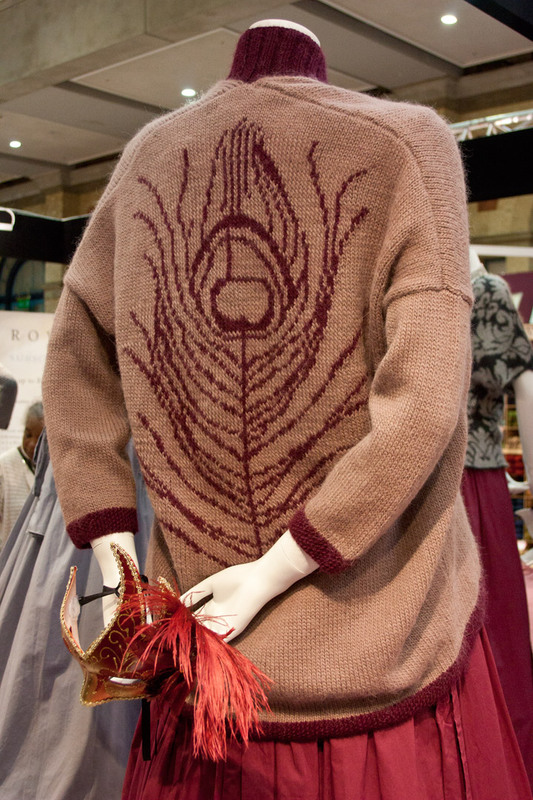 Many key pieces and yarns from their A/W collections were on display at the Coats Crafts Stall which was one of the largest stalls in the exhibition. 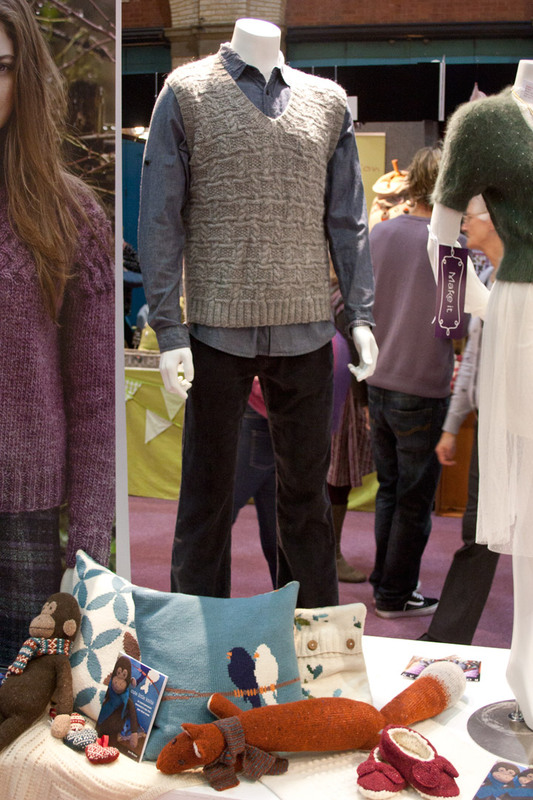 You can see some of their beautiful yarns on display, as well as the most recent publications including my favourite, Pioneer by Martin Storey and Kim Hargreaves’ Storm which has only been released last week. My favourite yarns this season include Rowan’s Alpaca Colour, Thick’n’Thin and the new Fine Art colours. Sadly there were no samples of the highly anticipated Fine Art Aran, but hopefully the Knitting and Stitching Show at Harrogate in November will have some samples. Caris and Annis from Kim Hargreaves’ Storm. Caris is definitely one of my favourite designs this season, it looks modern and classy at the same time and is knit with Rowan Kidsilk Haze and Fine Lace. Just look at the beautiful styling of the mannequins.. It was all about the knitwear, but I somehow can’t help wanting one of those amazing skirts which are hand-sewn by the in-house design team. Another of one of my favourite pieces this season – Almanac from Martin Storey’s Pioneer. I would probably make it in more peacock-y colours however. Navy with green and gold accents perhaps instead of pink and red tones. Some samples from Jem Weston’s book Cute Little Knits – Isn’t ther Lovebird Cushion adorable? And I don’t need to tell you how much I love Fantastic Fox! I had the great pleasure of meeting Designers Martin Storey and Rachel Coopey, who were both signing copies of their newest books Pioneer and A Knitted Sock Society. 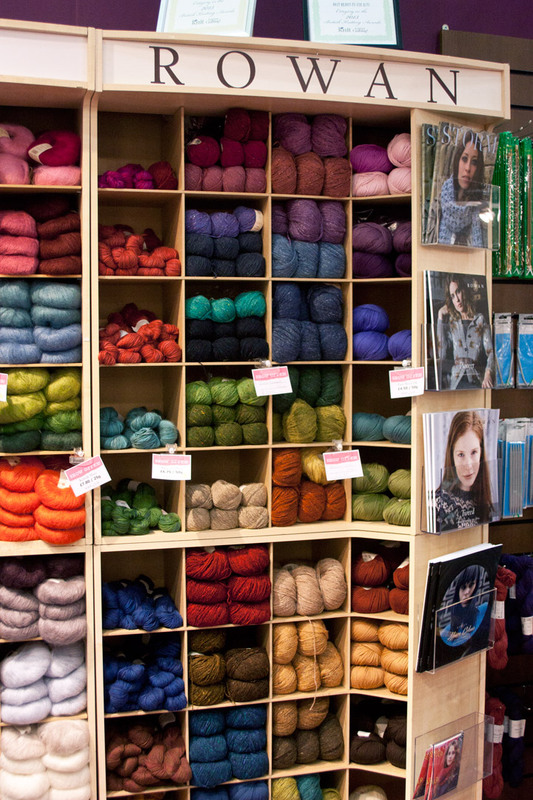 Another of my favourite British Yarn retailers, Toft were well worth a visit. Their stall was buzzing with customers, it must have been a very successful event for them. 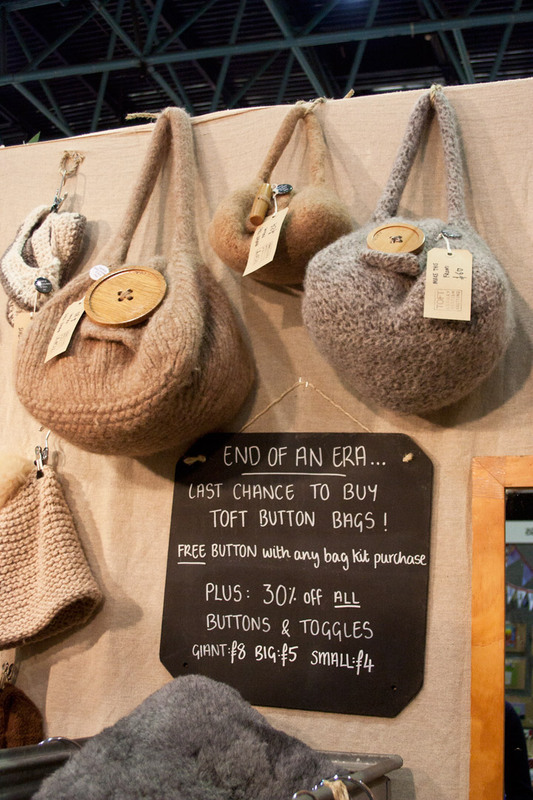 They are famous for their signature bulbous Button Bag. The bags are sold as kits to make at home, but if you can’t knit you can also hire a knitter to make one for you! These beautiful bags are sadly being discontinued, so if you have been wanting to make one, now is your last chance! 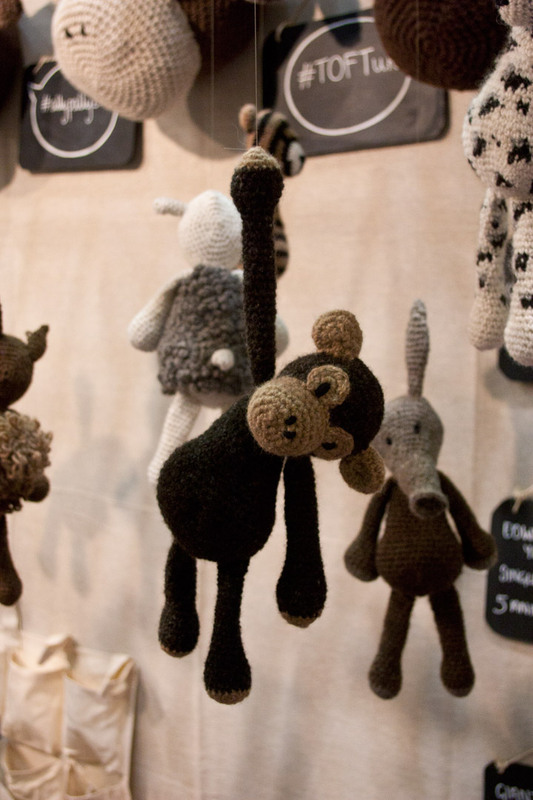 Their newest pattern book, Edward’s Menagerie, which features many cute crocheted animals, was available at the Knitting and Stitching Show as a Limited Printed Edition. It was sadly sold out by the time I got to visit their stall, but you can get a digital copy here. 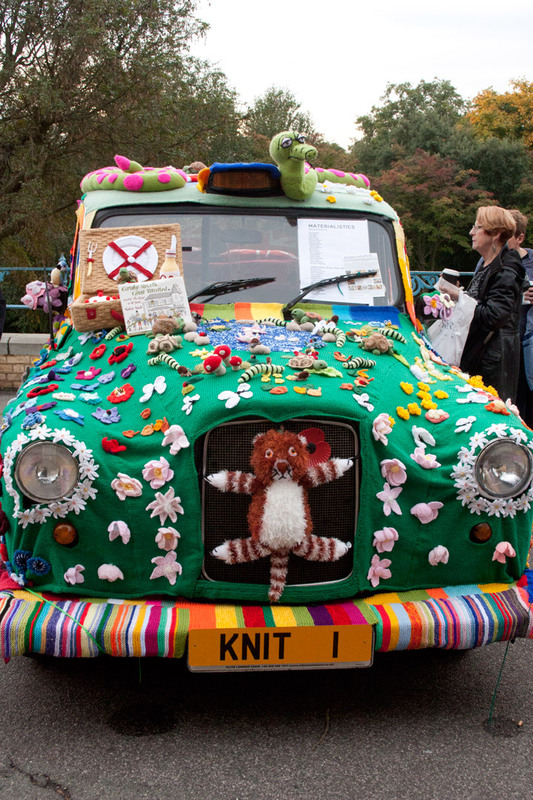 On the way out I managed to get some pictures of KNIT 1, a black cab which has been yarnbombed and covered entirely in knitted objects! 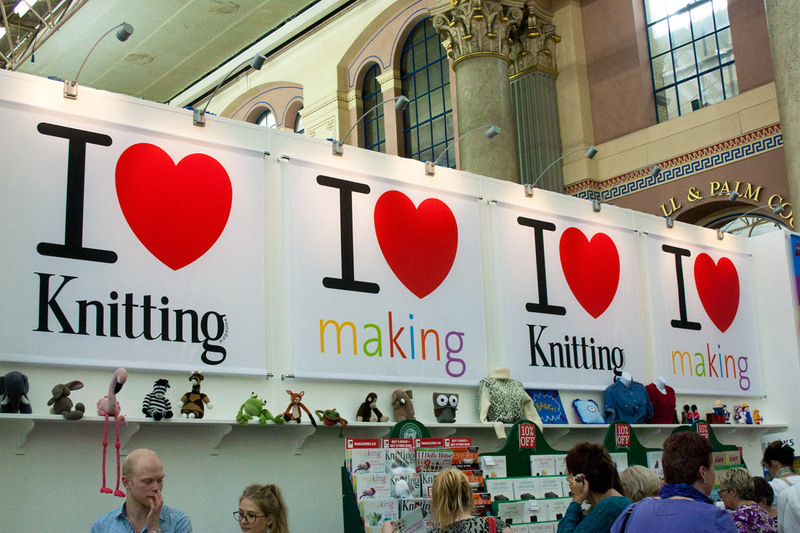 I had a wonderful time and have already marked the dates of The Knitting and Stitching Show 2014 in my calendar (and who knows, I may even go to the Harrogate one in November, that’s how much fun it was!). 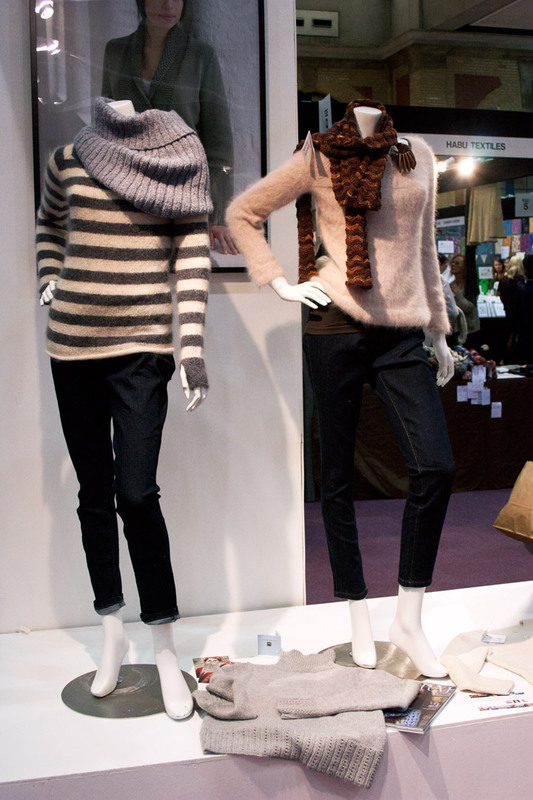 Next up will be Wool Week and Knit Nation. I am participating in a live yarn bombing of a window display in John Lewis Oxford Street.. stay tuned for footage of our progress and other fun events and workshops!